First arrival to Kolkata no doubt brings a fair share of culture shock. The city is far from a holiday destination, it’s not really a place to be chasing Dharma, or enlightenment, it is more of a city of realisation. Realisation that extreme poverty isn’t just found on TV and in text books. On Our First Visit we didn’t expect poverty to be this real. On our travels in India we make two visits to Kolkata, one en route to the Northern Mountains of India, then again on the way back down. I can’t say we were overly enthusiastic on either visit, but we do work to make the most of them. We follow the usual tick list; New Market, Victoria Memorial, Belur Math… all worth a visit, I guess. But if we had to chose just one attraction in Kolkata it would definitely be Dakshineswar Kali Temple, the only attraction which left a lasting, likeable, impression. An impression not tainted by relentless pestering and hard-sell which is found almost everywhere else in the city. It wasn’t until our second visit to the city where we reach the Dakshineswar Kali Temple compound, our first attempt have been Drenched in Monsoon Rains. If planning a visit to Dakshineswar Kali Temple I suggest taking a direct taxi which, as expected, are cheap. The taxi drops us to the side of the compound, already past the touts and religious stalls which sell all sorts of pilgrim trinkets. While the knickknacks on offer do look more interesting than usual tourist junk, we just couldn’t bare more of the in-your-face hard-sell. On the rare occasion where I do shop I would rather see an item and a price tag. Haggling to me is like a mix of shopping and arguing, and I hate them both. Anyway, continuing into the compound, on the left is Dakshineswar Kali Temple, but we are quickly drawn right by rattling branches and obvious signs of monkeys. So the Dakshineswar Kali Temple monkeys prove to be the most unappreciative monkeys I’ve ever met, miserable looking, picky eaters, appearing almost insulted by generous offerings of bananas. Fatty (below) in particular, the ground below him strewn with ripe, half eaten bananas and unopened packets of monkey nuts. 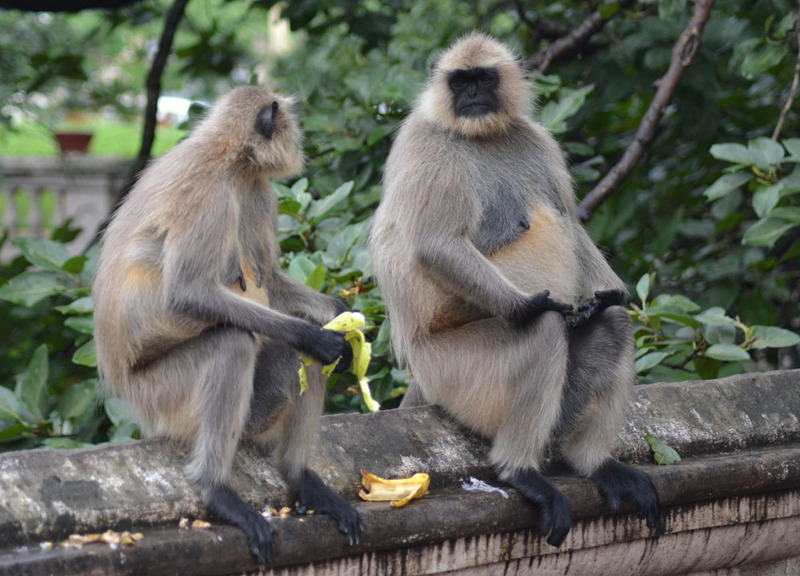 Considering the surrounding poverty in Kolkata these gangly primates were just downright rude. That being said I do like them. The monkeys at Dakshineswar Kali Temple are gray Langurs. They are grumpy, ungrateful and spoiled, yet I do prefer them to the mischievous macaques which we regularly encounter in Asia. The Langurs here have no desire to grab us, or steal our belongings. Instead they just look down on us with contempt, insulted by our offerings, and somewhat p***ed to share their space with us beings. In short, I wouldn’t waste my pennies feeding them, but they are surprisingly adorable. These scenes are what brought me to Dakshineswar Kali Temple in the first place. 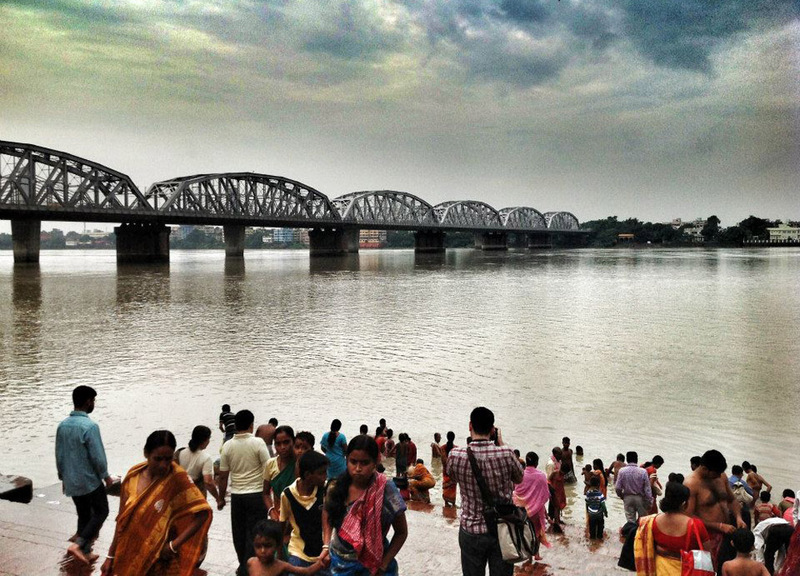 When I picture India I always see overcrowded trains and locals bathing in muddy rivers. While I’m yet to experience the former, at Dakshineswar Kali Temple I was able to capture the latter. This for me is cliche India, the post card picture from the over adventurous uncle. It is also a scene easily accessible in Dakshineswar Kali Temple which sits snug on the banks of the Hooghly River. While not quite the Ganges it does comes second best. The Hooghly River is in fact a distributary arm of the River Ganges, and like the Ganges, the waters of the Hooghly River are ‘Holy Ganga’ used to perform holy and religious ceremony. So we no doubt look and feel alien here, far out-of-place. Me with my big lens and Fanfan snapping shots on the iPad. But at the same time we feel almost invisible in our surroundings. Unnoticed by the streams of passing revellers, and the nakedness of locals unfazed by our prying lens’. A first for us in Kolkata where we always feel the centre of attention. This scene was alone worth the visit, set under the backdrop of the busy Bally bridge, and it brings that feeling of rubbing shoulders with Michael Palin (at least to me). So we don’t visit the temple itself, which I know sounds a little absurd. At the time we were just happy to potter around and immerse in the unique local life, culture and riverside bathing scenes. Plus, to enter the temple meant removing our shoes, the ground was wet, and dirty. In many ways we had visited Dakshineswar Kali Temple to escape the discomforts of Kolkata, not to add to them, and I feel the reason we love it so much was the respite from the seemingly endless annoyances elsewhere. While I do love the bustling street life of Kolkata, the experiences are also hard to savour when being strong-armed by a tout. In our visits to Kolkata we cross paths with next to no tourists or travellers. Not one at Dakshineswar Kali Temple. Outside of Sudder Street we remember seeing only two other travellers glimpsing them on passing in a taxi. A couple, girl and guy, stranded on a road island, struggling with their backpacks, looking confused and a little bit terrified. Kolkata is no doubt the perfect place to lose your comfort zone.